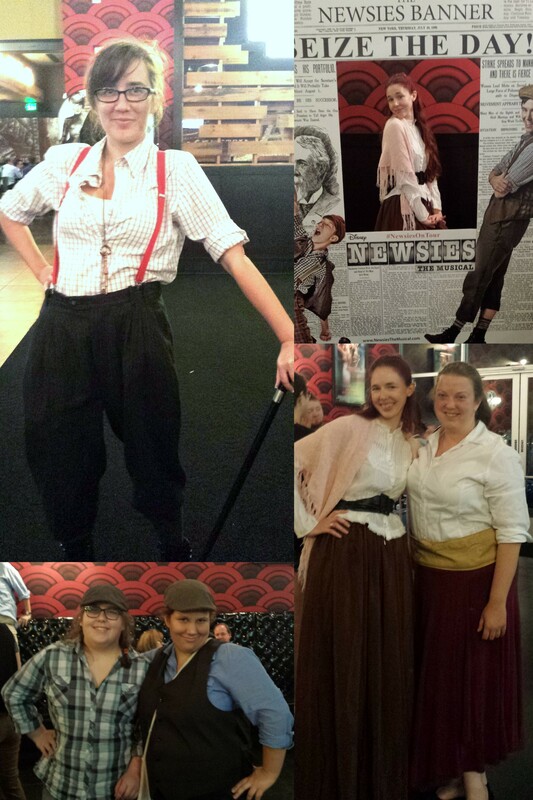 Tonight was the “Newsies” sing-along at the Alamo Drafthouse in Richardson, TX. I had so much fun! If it’s ever offered somewhere in your city, I highly recommend going. Nothing like watching the movie on a big screen while singing along with other fans! My first time seeing the movie was actually a few years after it flopped at the box office. Christmas of 1996. My younger sister and watched it over and over again while I was home on break, sometimes watching it two or three times in one day. Watching the TV-formatted version is definitely not the same as seeing it on a movie screen. I dressed up as Sarah Jacobs, pulling things out of my closet to put together. (Although I did end up buying a pink shawl at the thrift store for the outfit she wears when the Delancy brothers accost her.) People just don’t show Sarah enough appreciation. After all, she did punch Morris Delancy—even if it wasn’t that strong of a punch—when most of the newsies get out of his way. On our way out to the lobby afterwards, she & I got stopped by two people who were thrilled to see that we had both dressed as Sarah, being self-proclaimed members of the “Sarah Jacobs Appreciation Society.” So of course I had to get a photo of the two of them dressed as the Broadway versions of Jack Kelly and Racetrack Higgins. (“Racetrack” even had the black eye from later in the show.) And also of the lovely Spot Conlon who had all of his swagger.